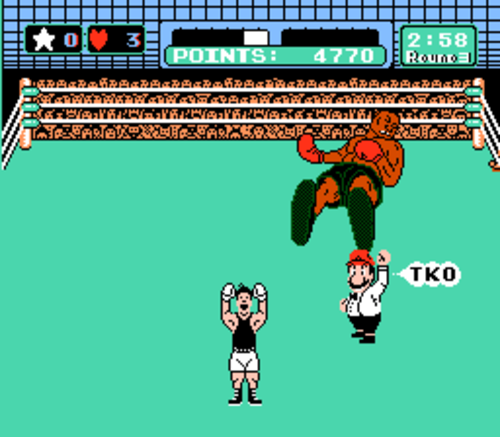 In the first part of vCloud API/GUI Throwdown, we watched in awe as the API completely pummeled the GUI. I gave you some hints in part 1 to do this on your own with the API, but this time around we're going to use PowerCLI 5.0.1 and the new vCloud Snap-in! This will make an EXACT copy of the vApp, MAC addresses and all. If you don't want that, you'll need to make some modifications. Hit the comments for specific requests. Lines 1-2: Add Snap-in and connect. Lines 4-6: Source, Destination, and vDC names. Lines 8-9: Get vApp and vDC objects Line 10: Create a CloneVAppParams Object. This is all the info vCloud needs to clone the vApp. Line 11: Create a InstantiationParams Object. This is a container object for the OVF data. Line 13: Add OVF Data to InstantiationParams Object. Notice I picked specific sections of the OVF [0,1,3]. Section 2 is NetworkConnectionSection. We just need Section 3: NetworkConfigSection. Attempting to clone Section 2 will cause it to fail. I'll deep dive later. :D EDIT: If you are not utilizing vApp Networks, you should only copy sections [0,1]. I will follow up with another blog post dedicated to cloning and customizing vApps. Line 14-16: Put our InstantiationParams and other info into our CloneVAppParams object. Line 18: Clone! 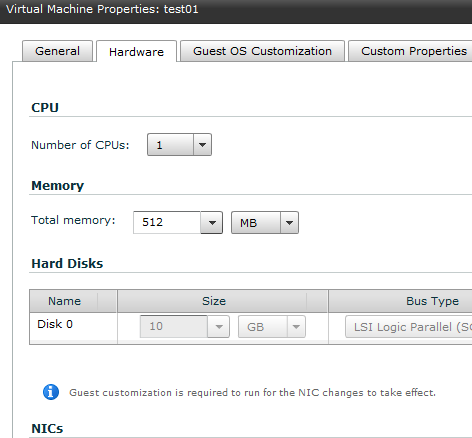 This will change the network, and assigned IP in vCloud Director if you are using a Static IP Pool address. This does NOT change the guest address. You'll have to change it manually in the OS or force re-customization. Line 1: The name of the network you want your VM connected to. Line 3: Get the VM. Line 5: This is a long line. It basically says Get the Network Connection OVF section and assign the first NIC to the new network. Line 7: UpdateServerData() This sends the updated changes to vCloud Director. Cool, eh? Also, I shouldn't need to tell you that THIS IS DANGEROUS. For giggles, I tried to set it to a lower size. 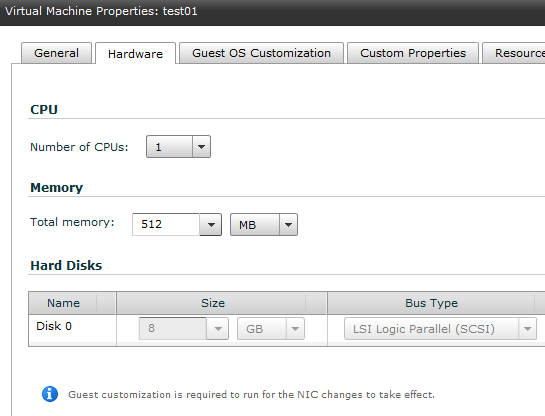 The command threw an exception, but vCloud still displays it at the lower size. I'll update after I check if vSphere actually allowed this (I'd be surprised). If not, it'll be a bug report to VMware. Either way, make sure you are GROWING the disk. Mind the zeros. Line 1: Get the VM Line 2: New size in megabytes. Line 4: In plain English...Get the disks from the OVF hardware section, set the first disk's new size to the new value. Line 5: Update server data. Bonus! Hot Modify Org Name! The fine chaps over at vcoteam.info mentioned adding the ability to hot change an Org name to the list, which you can't do in the GUI. Watch this. Three lines of code...Ready? You'll need to be a system admin for this one. Line 1: That Line 2: was Line 3: easy. Have a specific vCloud API request? Let's hear it in the comments!